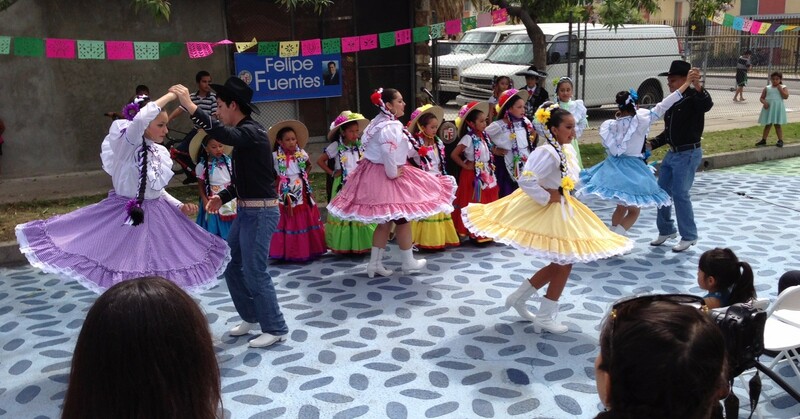 Folklorico dancers at the 2015 opening of People St’s Bradley Plaza. Photo by Joe Linton/Streetsblog L.A. This week, the national American Planning Association (APA) awarded its National Planning Achievement Award for a Best Practice to the city of Los Angeles’ Transportation Department (LADOT) People St program. SBLA readers are likely familiar with People St, which is responsible for over a dozen new community friendly spaces—including plazas, parklets, and bike corrals—on the streets of Los Angeles. People St is an ongoing program wherein LADOT partners with local stakeholders—businesses, nonprofits, others—who request these facilities. We are so proud to have won this prestigious award from APA. People St represents a collective and collaborative lift from the City staff and consultants who worked tirelessly to create this innovative program, to our community partners who rally their expertise and resources to partner with the City to bring the projects to life. This recognition is a testament to the power of working hand-in-hand with communities to unlock the potential of their streets. More details on the best practice award is available at People St and APA websites. Kudos to everyone involved in making these People St projects such great successes. More please!